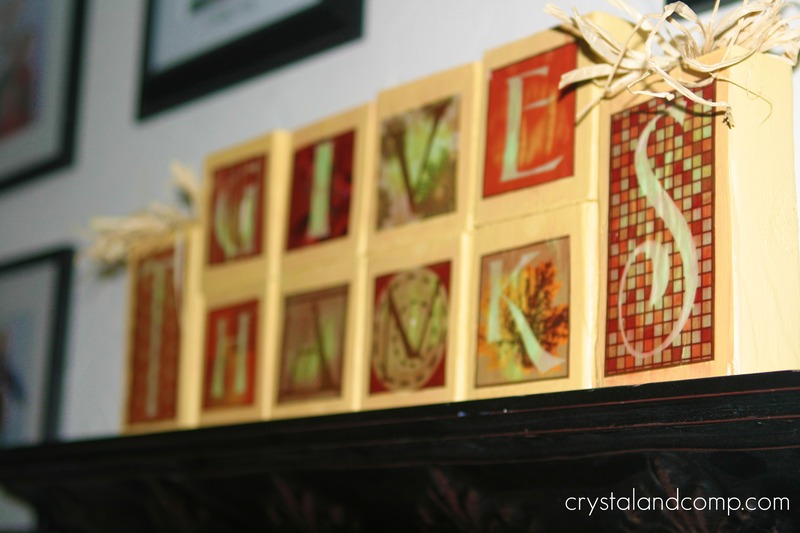 I have a Thanksgiving free printable for making these amazing give thanks wooden blocks. This project takes less than $5 in supplies and is just adorable. You can display it on our mantle, a shelf or even in your dining room. 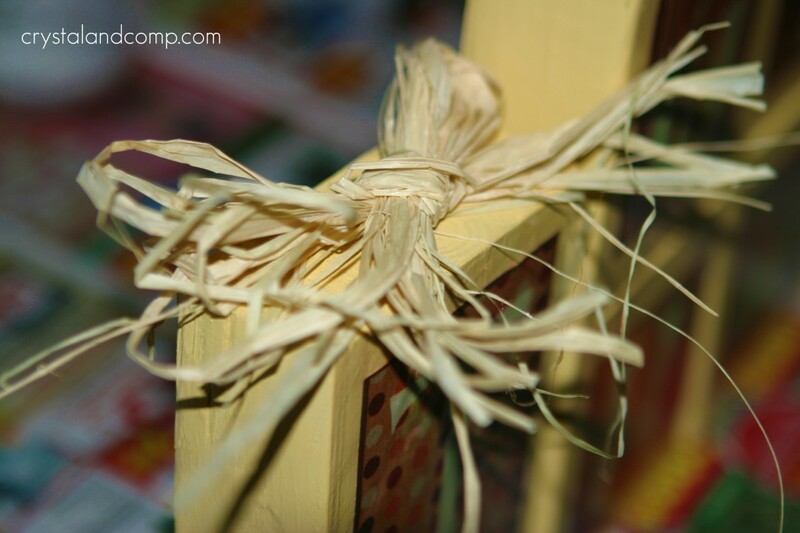 Better yet, let your children help you make the blocks and give them as gifts to family members or teachers. Cut your wood. If you do not have a saw you can ask them to cut it for you at the home improvement store where you purchase the lumber. You will need two blocks that are 5 1/2 inches tall and eight blocks that are 3 1/2 inches tall. Sand them down a little to smooth out the wood a bit. If you want to round the edges you can make them look like this. I went for the more rough look. Paint the wood. We chose a sample size of paint from made by Martha Stewart. The color is called Cornbread. She has a beautiful collection of fall colors that include names like Heath and Bay Leaf. Really pretty. You want to make sure you paint all the sides, edges and corners, etc. Let the paint dry 100% before moving on to the next step. Drying should only take a few hours. Print the give thanks printable. Cute the square letters out. 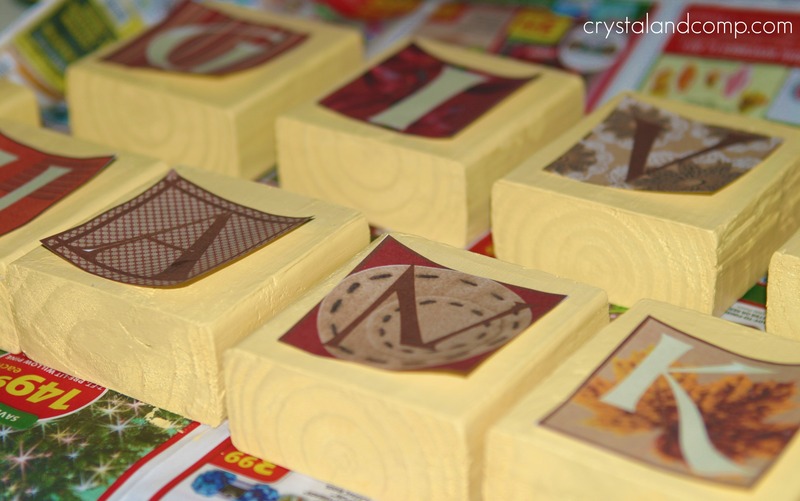 Place the letter cut-outs on your blocks. The letters T and S will go on the two larger blocks. The remaining letters will go on the eight small blocks. Pour 1-2 oz. 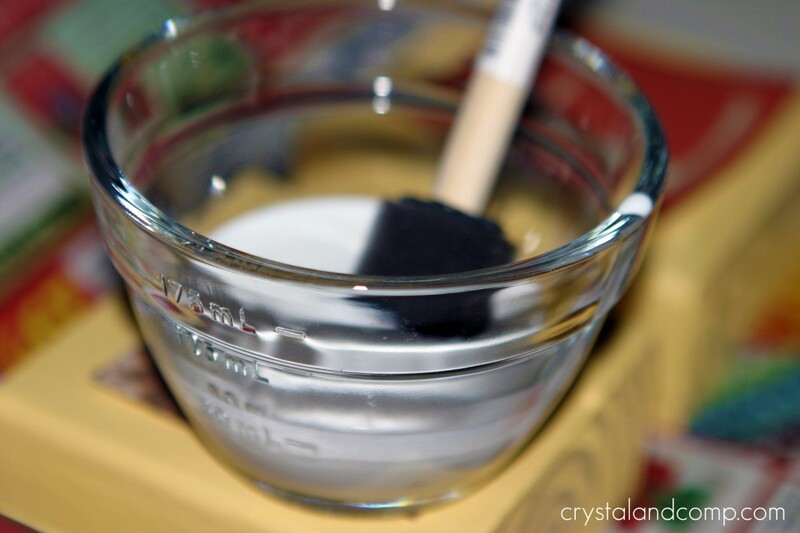 of Mod Podge into a bowl. 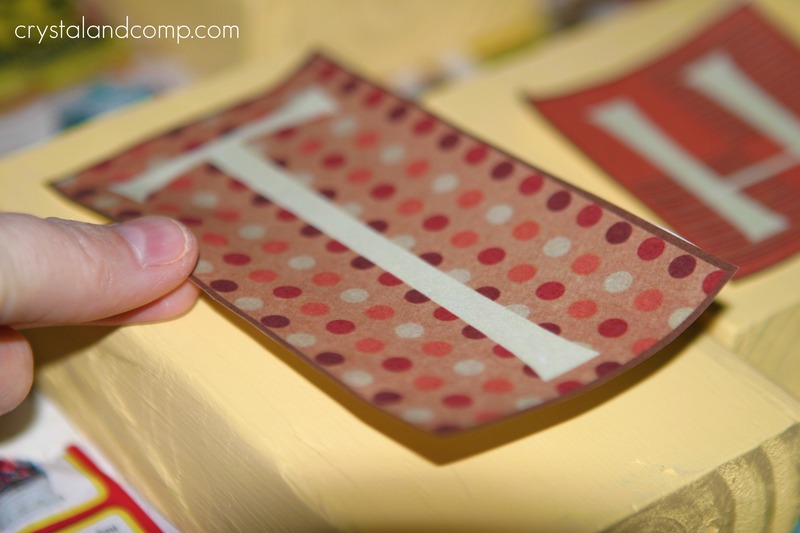 Use your sponge brush to apply to Mod Podge to the paper. Your printed colors may run a little. Don’t worry, colors that run tone down a lot in the drying process- they will be very pretty when they dry. 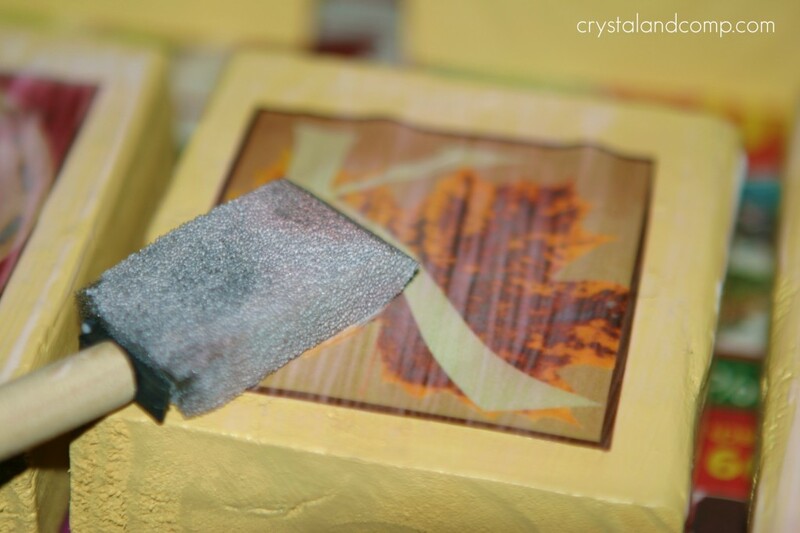 You do want the paper to remain smooth- no lumps or crinkles. 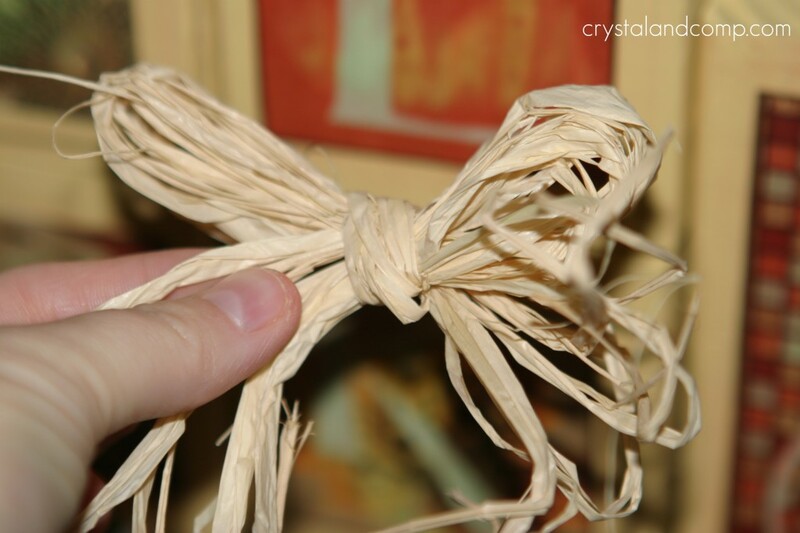 While the Mod Podge is drying, grab some raffia and make two bows. You can omit this step if you want, but I think it gives a really nice touch. 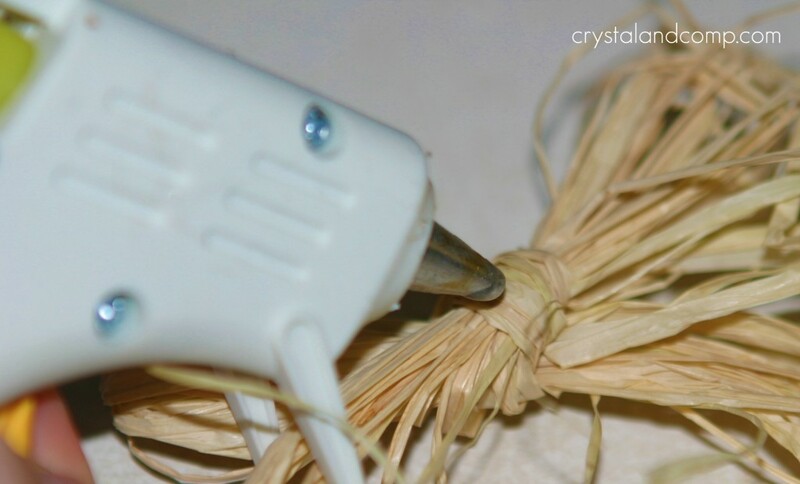 Apply some hot glue to the back of the bow. Attached one bow to the top of the T block and one bow to the top of the S block. I added mine to a shelf in our living room. Love the printables I offer my readers? Kelli over at 3 Boys and a Dog makes all of my printables. Her prices are very affordable and her turn around time is very quick. Hop over and check her out. Really fabulous blocks. Thanks for the printables too. So cute! I would love if it you would stop by Fall Into the Holidays and link up! I love this idea. I have pinned for inspiration. I saw your link on Hookin Up With Hepworths. thanks for sharing the printable too! Oh, Carolyn. That is awesome! I would love to see a picture of how they turn out! Love this idea! I featured you yet again today! Thanks for linking up! I just finished these blocks last week, and we love them. My hubby cut the wood for me, and I did the rest. I encourage anyone to do this project; it’s easy and very inexpensive, and the colors in the graphics are gorgeous! We are always frustrated by the lack of home décor for Thanksgiving, and we are so glad to add the blocks to our home. 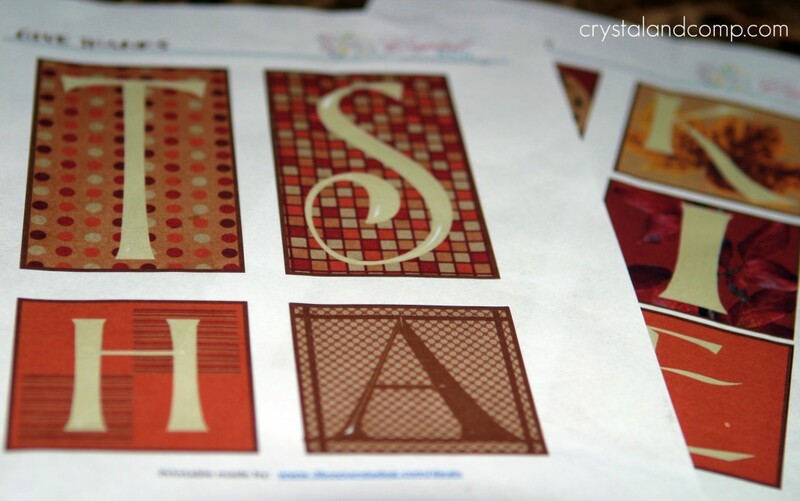 Crystal, do you by any chance have any such printables to make Christmas or other holiday blocks? Thank you so much for the free printables, and the beautiful designs and colors. LOVE!!!! (think sing-songy voice) So cute and looks so rich. Thanks!!! Thank you for the lovely printables and easy-to-follow instructions. It came together quite nicely (if I do say so myself). 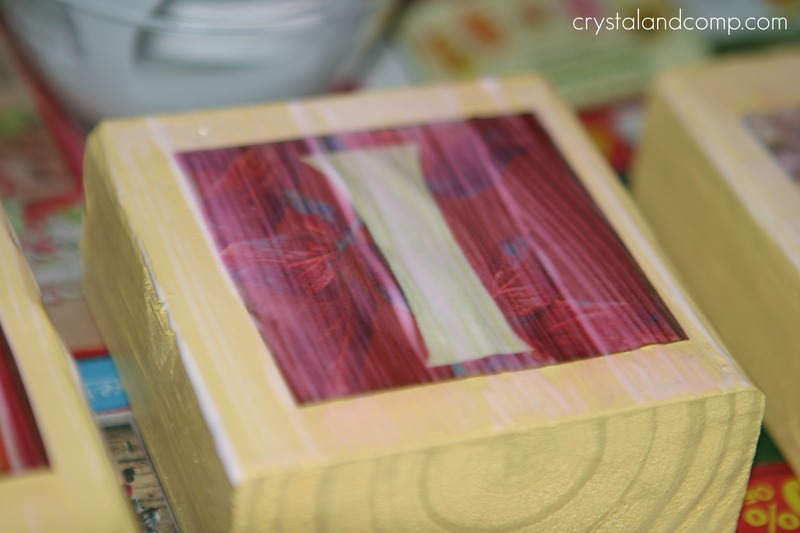 I stained my blocks to give them a rustic look and decorated the opposite side for Christmas with, “Joy to the World”. Happy Holidays!! Love those blocks. They are all so cute. I will probably make a number of them as presents for my relatives. Thanks for sharing! Do you happen to have this for Christmas or any other holiday? I made this one and love it, but I want to do another holiday as well.